A collection of decadent all vegan summer desserts from some fantastic food bloggers. Mouthwatering recipes that you can indulge in all summer long. I love summer and I love desserts. 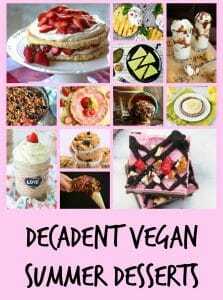 So with this in mind I have decided to curate some amazing and decadent all vegan summer desserts from some of my fantastic fellow bloggers. 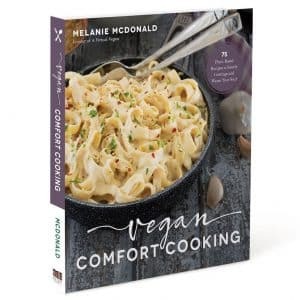 Here you will find mouthwatering recipes that you can indulge in all summer long, or make for your friends and family without them having an inkling that they are eating “vegan” food. 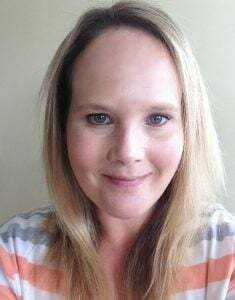 Welcome to my very first round up guys! 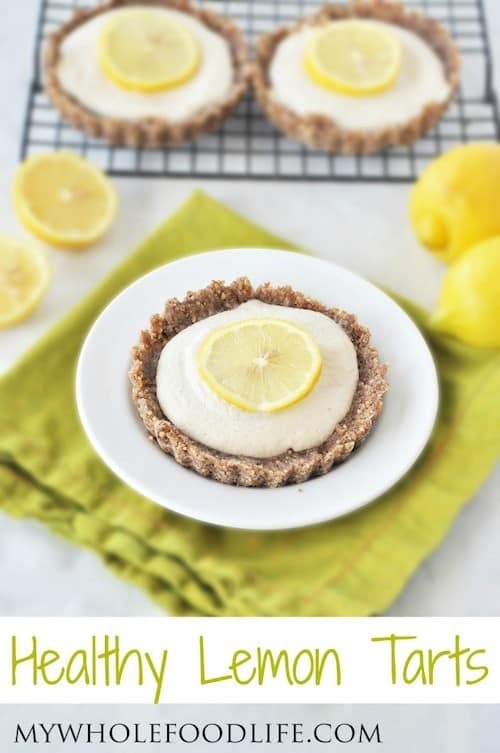 First up we have these beautiful Healthy Lemon Tarts from mywholefoodlife.com. These Healthy Lemon Tarts are grain free, gluten free, raw, vegan and as an extra plus they come together in minutes. They are full of fresh, healthy ingredients and I can vouch for the fact that they taste as good as they look! 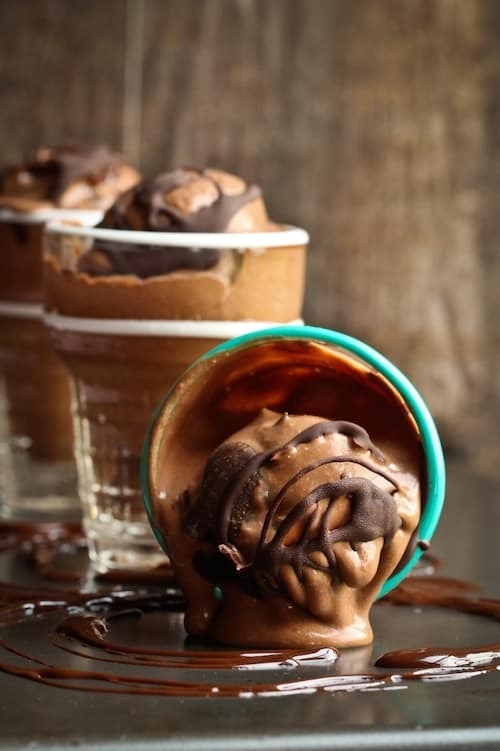 Next up is this amazingly rich and decadent 4 Ingredient Chocolate Ice Cream from thevegan8.com. As the name suggests this ice cream has only four ingredients, one of which might come as a surprise to you. Can you guess what it is? Shall I put you out of your suspense? ……It is…wait for it…….sweet potatoes! This 4 Ingredient Chocolate Ice Cream is dairy-free, oil-free and nut-free and requires minimal prep and minimal ingredients. Sounds great don’t you think? 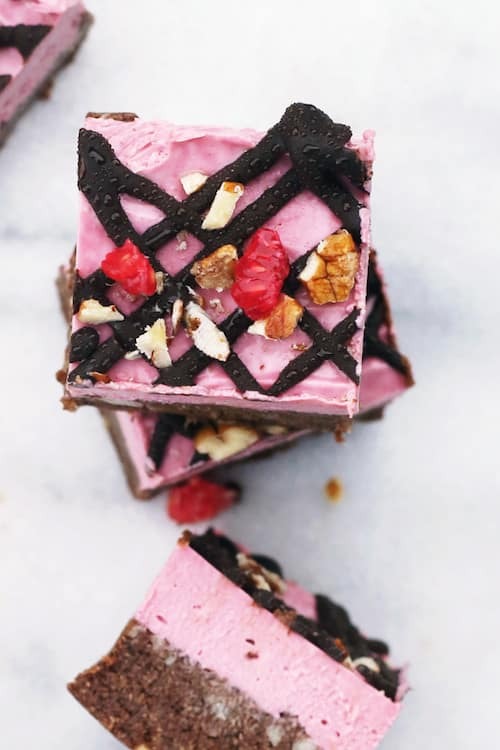 And now we have these pretty in pink Raw Chocolate Raspberry Brownies from Crazy Vegan Kitchen. These delicious little morsels are composed of a raw chocolate brownie base which is topped with creamy, delicious raw raspberry cheesecake. They are deceptively easy to make and if you can actually manage to let anyone other than yourself eat them they will think you spent hours in the kitchen making them. 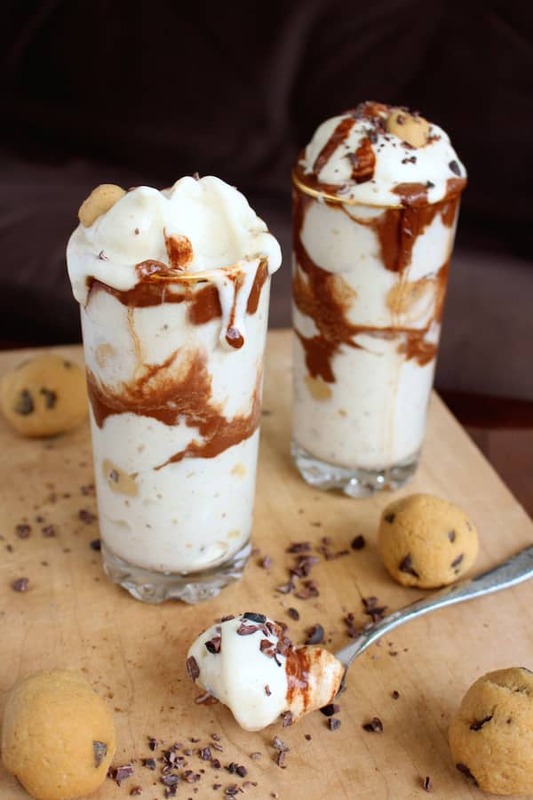 Don’t these Peanut Butter Cookie Dough Banana Ice Cream Blizzards by theconscientiouseater.com just make you salivate with desire? These Peanut Butter Cookie Dough Banana Ice Cream Blizzards are composed of banana ice cream, with pieces of soft, doughy cookie dough mixed throughout to create a blizzard and topped off with chocolate sauce and some crunchy cacao nibs. They are the perfect summer treat! 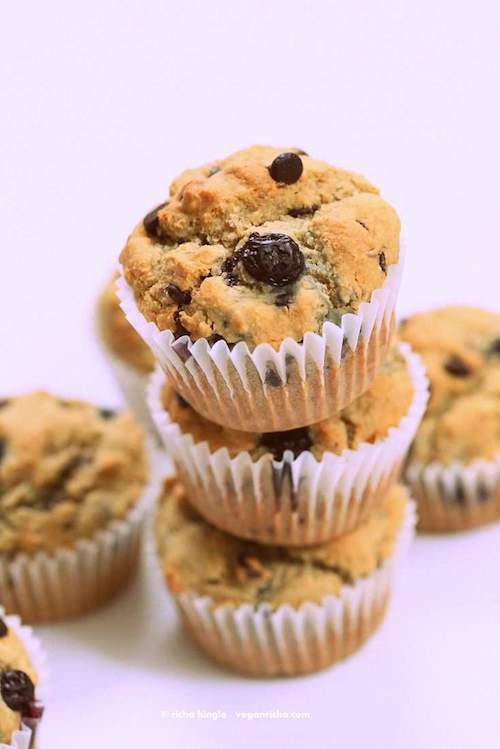 These Blueberry Chocolate Chip Muffins by veganricha.com are soft, moist and gluten-free. They are filled with blueberries and chocolate chips. The almond flour, coconut flour and oat flour keep these muffins moist and coconut flour adds extra softness. The addition of non dairy yogurt adds the moisture needed in these gluten-free Blueberry Chocolate Chip Muffins. How good does Strawberry Lemonade Pie sound? 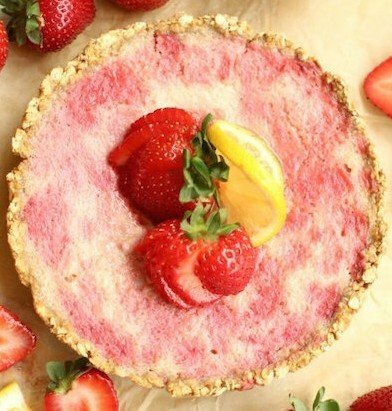 This Strawberry Lemonade Pie is brought to you by feastingonfruit.com and is “sweet-tangy perfection” and the swirly filling looks just beautiful. This pie brings together the freshness of lemon and the sweetness of strawberry in a delicious crunchy crust. 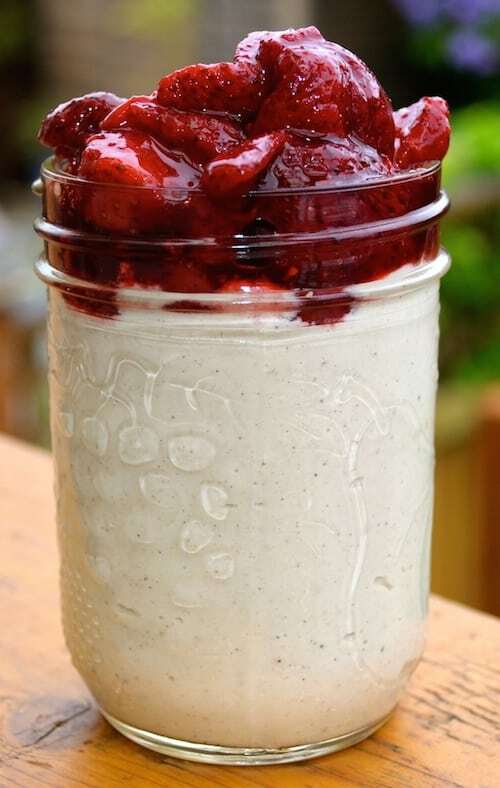 This truly decadent Maple Ginger Strawberry Shortcake by Connoisseurusveg.com just looks scrumptious. 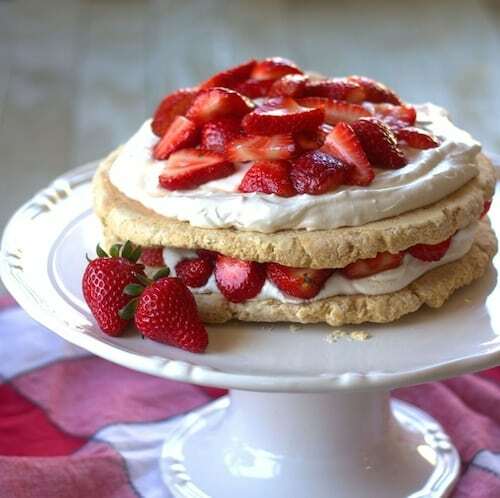 It is made with a double layer of rich vegan shortbread and is stacked with coconut whipped cream and maple ginger marinated strawberries. Some of my favourite flavours and textures all rolled together into one amazing dessert! Who doesn’t love key lime pie? Especially when it’s a raw, healthier version with no compromise in taste! This raw key lime pie by win-winfood.com is decadently rich and has just the right amount of sweetness and tanginess with an irresistible melt-in-your-mouth texture. 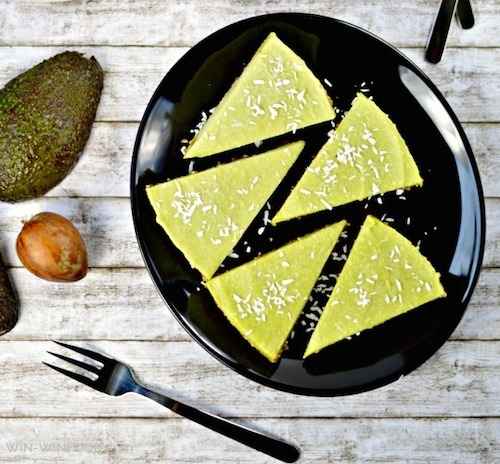 This delicious vivid green dessert is made from healthy, natural ingredients that nourish your body and taste amazing at the same time. And whilst on the subject of key lime pie, how about a Raw Key Lime Raspberry Pudding Parfait? 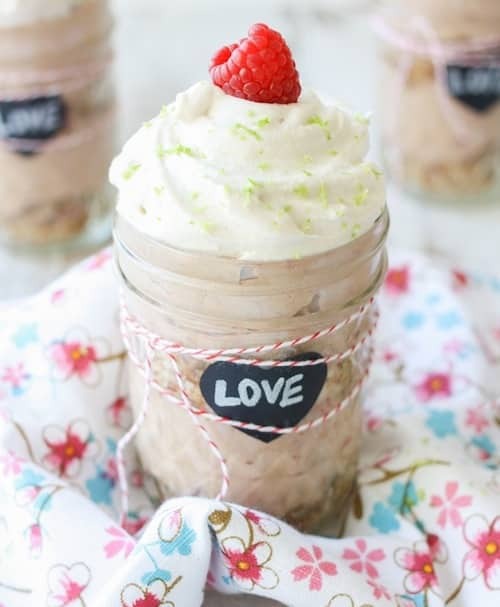 These Raw Key Lime Raspberry Pudding Parfaits by veggiesdontbite.com are a sweet and tart combination of nutritious raw ingredients. Their delicious creaminess comes from an indulgent combination of both nuts and avocado. Don’t you want to dive into one right now? What says summer more than a 3 Berry Cobbler? 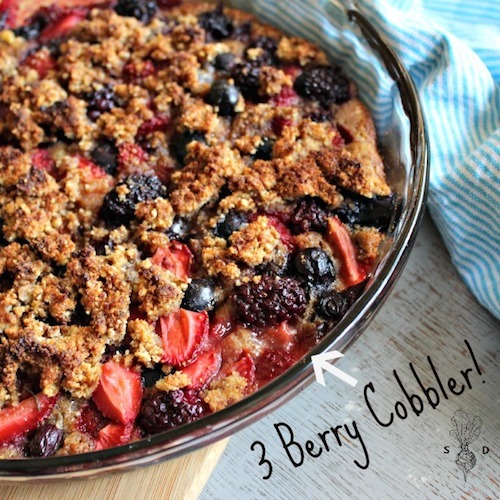 This 3 Berry Cobbler by theseasonaldiet.com is stuffed full of antioxidant rich mixed summer berries and is gluten free. Wouldn’t it just be perfect with a cold dribbley dollop of non-dairy vanilla ice cream? 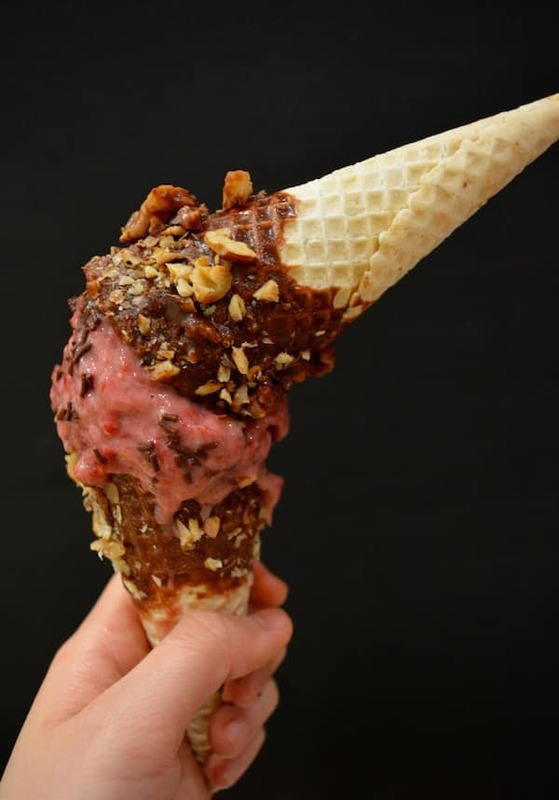 This Raspberry Ripple Ice Cream by yourwellnesstogo.com is super easy to make and chock full of wholesome, tasty raw ingredients. I want one of those delicious looking cones right now! And for those of you who will be grilling in this wonderful weather here is one for you! 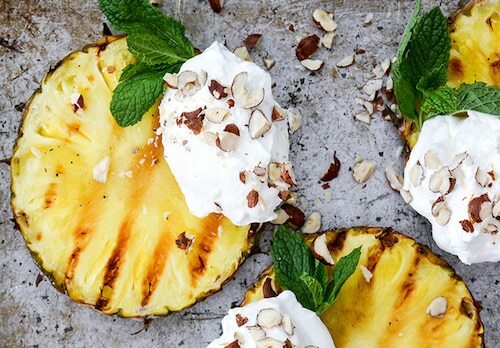 Grilled Pineapple with Coconut Whipped Cream by floatingkitchen.net. How delicious does that look? It makes me want to go fire up that grill! With rich, thick coconut whipped cream, zingy lime, and crunchy hazelnuts, this pineapple is just divine! And now time for one of mine. Here are my Roasted Strawberries with Vanilla Bean Cream. If you have never roasted a strawberry you really don’t know what you are missing! These syrupy, deliciously tangy strawberries sitting atop decadently thick vanilla bean cream are just divine. The strawberries also make a wonderful topping for pancakes or waffles! 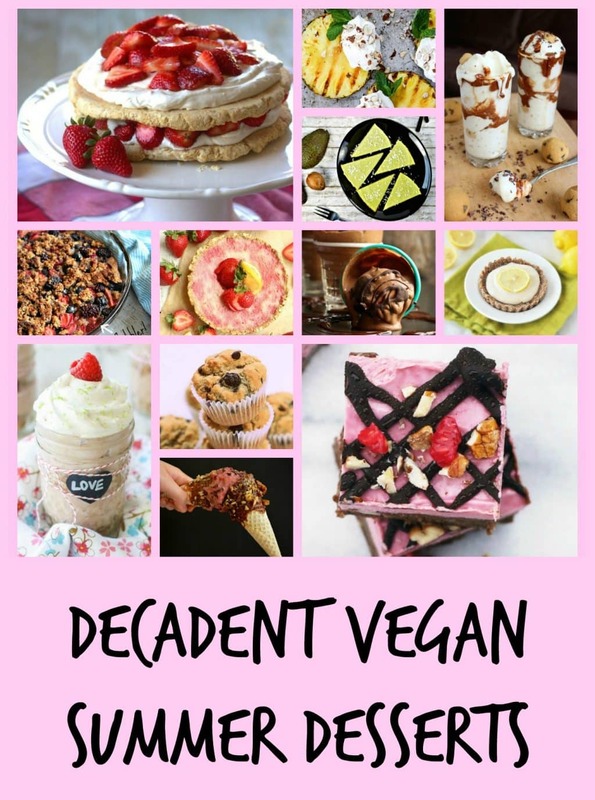 And if that isn’t enough for you check out some more decadent vegan summer desserts below! And last but certainly not least, Sweet Saffron Rice from veggiebusonsimpleroute.blogspot.in. 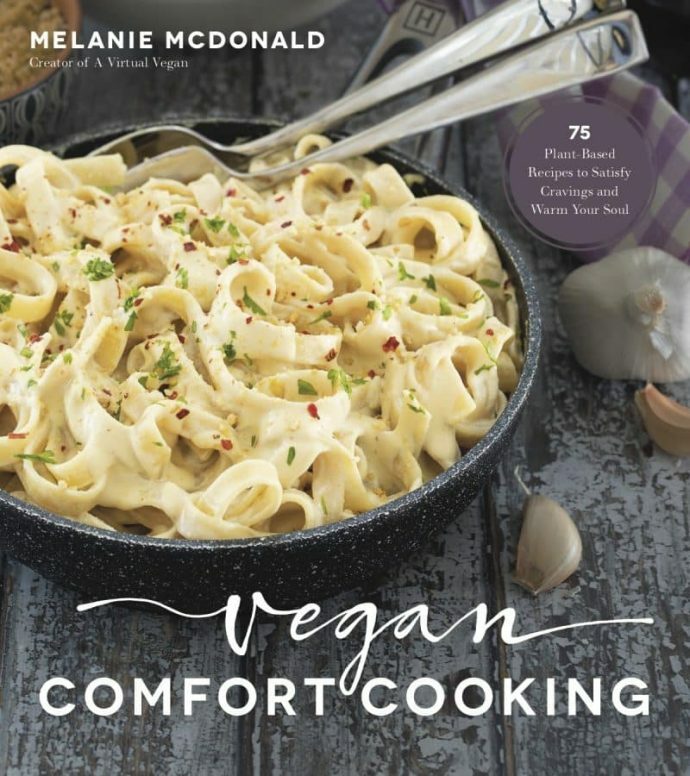 Although one of the ingredients in this is ghee which is not vegan, it looked too good to miss out and you can easily sub the ghee for coconut oil to make it vegan. A big thank you to all the wonderful bloggers who have made this Decadent Vegan Summer Desserts Round Up possible. I think you will all agree that there are more than enough decadent desserts here to keep you going throughout the whole of summer and beyond! Never Miss A Recipe – Join my mailing list. You’re welcome Molly…your recipe looks great! Everything looks amazing! Thanks so much for including my 4 Ingredient Chocolate Sweet Potato Ice Cream! Just pinned! Mmm…this roundup has got me craving some serious yummy desserts. Everything looks awesome! Thanks for the grilled pineapple love! I know the feeling…they are dangerously good! What an awesome collection! Everything looks incredible! Thanks so much for including my strawberry shortcake! Thanks Alissa and you are welcome ???? Looks like a yummy collection! Thanks for including my gluten free chocolate chip cake with strawberries and coconut cream! Thanks Margaret and you are welcome!